A healthy substitute for red meat, chicken takes well to a number of cooking methods and is readily available. 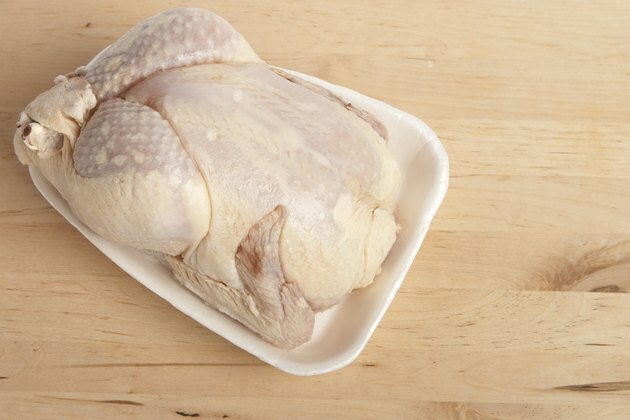 Frozen chicken is often cheaper than fresh chicken and has the added benefit of having longer storage times than fresh chicken does. You can also freeze extra fresh chicken. Commercially frozen chicken is often blast chilled or flash frozen to preserve as much nutrition, texture and freshness as possible. A quick freezing process prevents the fluid inside the chicken from turning into large crystals, which can cause faster deterioration in texture and nutrition. In some cases, commercially frozen chicken is injected with a saline solution, which means it has a high salt content. Flash-frozen chicken has a nutritional profile similar to fresh chicken's, as the process does not use any preservatives, although blast-chilled chicken may have more additives. A 3-ounce serving of raw, skinless fresh chicken has 101 calories per serving, with a little over 18 grams of protein and only 2.6 grams of total fat. Chicken is also a source of iron, potassium, vitamins K and A, and B vitamins, particularly niacin. In addition to buying prefrozen chicken, you can also freeze fresh chicken. It can last up to one year in a freezer that is zero degrees Fahrenheit or lower. To freeze chicken at home, portion out the chicken into the serving sizes you want, and then wrap the chicken in butcher wrap or place the servings in freezer bags. Remove as much air as possible from between the packaging and the meat to reduce freezer burn and minimize the amount of space taken up in the freezer. Do not freeze stuffed chicken, as the long freezing and thawing times can encourage dangerous foodborne bacteria. To cook frozen chicken, you first have to safely defrost it. The USDA Food Safety and Inspection Service recommends three ways of defrosting chicken: in the fridge, in the microwave or submerged in cold water. If the chicken is stored in airtight packaging, you can soak the chicken in cold water, changing the liquid every half an hour. To defrost in the fridge, place the wrapped chicken in on a plate and let it slowly defrost. In the case of microwave and cold-water defrosting, the chicken needs to be cooked immediately, while chicken defrosted in the fridge can stay there for an extra day or two. Can I Cook Chicken Straight From Being Frozen?